This study was performed to investigate the variables that influence the efficiency of decolorization of a solution containing direct orange 37 (C.I. 40265) by electrocoagulation (EC) in a cell with vertical aluminum rod anode surrounded by cylindrical aluminum cathode. 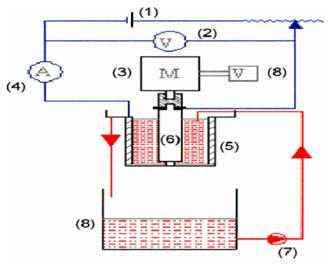 The effect of different operating parameters, such as current density, initial dye concentration, anode rotation speed, electrolysis time, dye solution circulation rate, solution conductivity and external coagulant addition was investigated. It was found that the EC decolorization efficiency improves with increasing current density, electrolysis time, solution conductivity, externally added alum concentration and lower initial dye concentration, solution flow rate and anode rotation speed. The results revealed that EC dye decolorization followed a first order reaction with efficiency up to 99% at 8 min electrolysis time for dye concentration 200 ppm, current density 1.1 m.A/cm2 and coagulant concentration 300 ppm. The cell power consumption was reduced by about 70% by increasing the dye solution conductivity through NaCl addition.